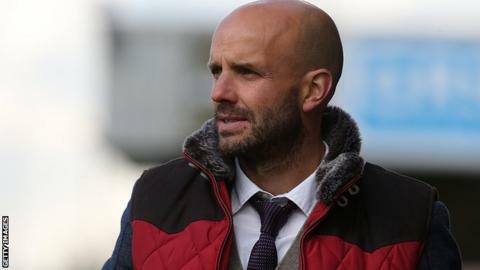 Exeter City manager Paul Tisdale says he is becoming increasingly frustrated by the effect of the poor weather on his club's training facilities. Heavy rain over the past few months has meant many parts of the club's Cat and Fiddle training ground are unusable. "It's very frustrating," Tisdale told BBC South West Sport. "Especially when you're a manager that employs a number of very good coaches and the ethos of the club is to develop and improve players." It has led to Tisdale having to use indoor facilities, synthetic pitches and even training on the beach. "We're having to be very creative, we're having to be very patient with the situation and just hope we get some good weather soon. "We're having to come up with as many exercises as we can in training that doesn't involve the ball being on the floor. "It's athletic exercises and training that the players are able to practice, things like heading the ball and volleying the ball. "But we haven't been able to have any continuity in the last few months." However Tisdale was quick to add that he did not want the lack of a consistent training facility to be seen as a reason for any poor performances. "I'm not putting it out there as an excuse because I still think we're capable of winning games. "The facilities didn't cost us the game against Torquay, nor did it stop us defending the lead against Barnet, it's just not handy. "I'm sure that clubs at our level have got all sorts of issues like ourselves. "We're happy with what we've got, but it's been difficult with the unusually bad weather we've had."